BETHLEHEM, PA¬¬–Twenty teams cooked up a fierce competition at the 10th annual Souper Bowl, the culinary contest held at the ArtsQuest Center’s Musikfest Café in Bethlehem on Jan. 26. When the soups cooled, the Culinary Arts students from the Bethlehem Area Vocational-Technical School were declared Souper Bowl Champions with their delicious take on Pumpkin Bisque with Smoked Gouda. The competition raised $19,000 for the Arts Education Fund for ArtsQuest, the nonprofit that presents Musikfest, Christkindlmarkt Bethlehem and programs at the Banana Factory arts center and SteelStacks. First runner-up for Souper Bowl Champion was Almost Home Catering for Cream of Crab Soup, while Joe’s Tavern took second runner-up for a Ham, String Bean and Potato Chowder. “This year’s Souper Bowl was special for many reasons. Not only did we reach a decade of celebrating the culinary arts, we’ve now raised nearly $140,000 over the past 10 years to support ArtsQuest’s arts education programming,” says Michelle Veresink Richmond, ArtsQuest Sr. Manager of Membership & Advancement Operations and coordinator for the Souper Bowl. 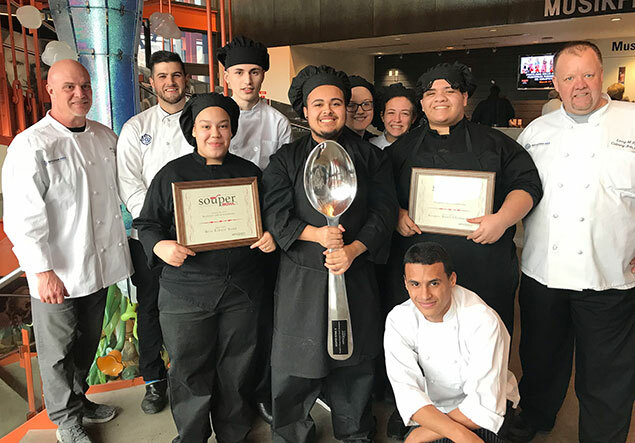 “We’re thrilled that BAVTS Culinary Arts students were the champions this year, since the Souper Bowl is an event that’s designed to support arts education opportunities in our region. Judges for Souper Bowl X were Michael Faccinetto of the ArtsQuest Circle, Alexandra Hogan from WFMZ-TV 69 News, Jennifer Sheehan from The Morning Call and George Wacker of Lehigh Valley with Love Media, LLC.